Traditional Shaolin Martial Arts is a fighting system that originated over 14 hundred years ago in the Shaolin Temple on Mount Song in the Henan Province of China. 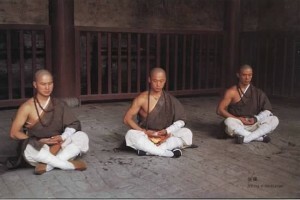 The foundations of Shaolin Martial Arts were introduced to Chinese monks by the Indian monk Ta Mo after visiting the Shaolin Temple during his pilgrimage. Ta Mo dedicated himself to promote personal protection, health and well being through teaching the series of martial movements and defense techniques known today as Shaolin Kung Fu. 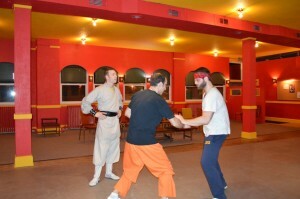 Although the roots of Shaolin Martial Arts began with Ta Mo's teachings, the principles and variations of Shaolin Kung Fu have been developed over hundreds of years by the warrior monks of Shaolin into a wide range of martial training methods including empty hand fighting sets (forms), animal forms, weapon forms, Qín Ná (joint locking methods) as well as chi gung/meditation training. Shaolin Kung Fu emphasizes on speed, balance, coordination and explosive power through the combination of both hard and soft movements. These movements are trained and improved by continuous practice of the eighteen basic movements of Shaolin as well as hand and weapon forms that increase with greater substance and complexity as the student progresses. Shaolin Kung Fu had remained a mystery to the world for many years, but now the many gifts it has to give has raised to the surface to benefit men and women of all ages. Our children's Shaolin Martial Arts class is a unique and fun approach not only for exercise but for also developing valuable skills that can help to keep them safe and healthy for a lifetime. Our students learn strength, balance, coordination and teamwork through training and practicing the fundamentals of traditional Shaolin Martial Arts. Through exceptional and definitive instruction of the methods of Shaolin Kung Fu we strive to provide our students with the proper skills to make the right decisions as well as the ability to defend themselves in the face of danger. In addition we believe it is a great benefit to expose our students to a cultural activity that is as rich as it is unique. Tai Chi is a martial method that was developed by Taoist priests over 300 years ago. Tai Chi primarily focuses on slow graceful movements and relaxing meditative breathing. 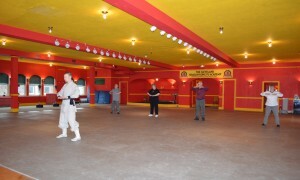 Traditional Tai Chi routines are designed for both health and subtle self defense applications. Additionally, Tai Chi is a recognized form of meditation and an exercise regimen known to bring both decreased aging, longevity, and greater physical stability for seniors. Though still uncommon to many westerners, in China, Tai Chi is trained widely among all age groups and it is quite common to see practiced publicly in open community sites and parks. This high energy class is designed for people who are interested in a rigorous cardio workout, while developing an understanding for fundamental kickboxing and self-defense methods. 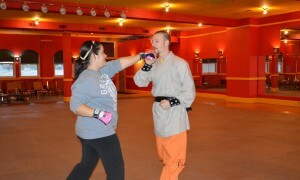 Coordination and footwork drills paired with a variety of offensive techniques will not only ensure a proficient workout, but also help to promote a sense of personal safety and confidence. The Cleveland Shaolin Kung Fu Academy offers instruction and guidance for understanding and employing the cultivation of internal energy. By understanding the principles of meditation, a student can learn to make use of the many possible health benefits that are revealed as well as the understanding of the relationship between internal skill and external martial ability. All respective classes in our curriculum contain a significant element of focus on meditation in energy cultivation. Private instruction available as well upon request. 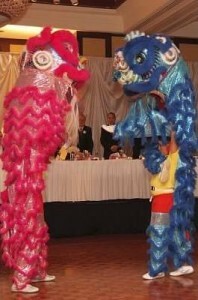 The ancient art of lion dance is a fun and exiting activity that is performed at many celebrated occasions throughout China. Students develop character, strength and teamwork while acquiring the opportunity to learn about traditional Chinese culture first hand. Part martial art, part dance, students utilize music, costumes and choreographed sets of synchronized movement to create a performance that is a unique enjoyable experience for all ages. Traditional Chinese lion dance is also a great way for our students to further enhance their developing martial arts skills. Available upon request. Please call or email for details.